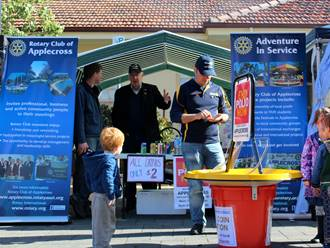 The Rotary Club of Applecross provides assistance with car park and pedestrian management outside the Perth Makers Market. 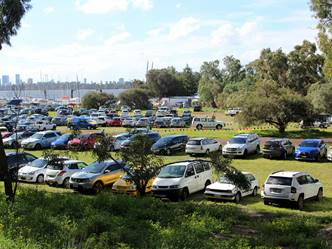 A market event is held on a Sunday, every 2 months, at the Heathcote Cultural Precinct in Applecross. The market provides a platform for the talented, high quality handmade crafters from Perth. With strong ties to the community and a focus on giving back, Perth Makers Market is unique. It actively assists both new and emerging artists, as well as talented school students to break into the handmade marketplace. Club members, often with assistance from other community groups, spend a number of hours assisting with setting up signage and safety barriers and overseeing car park management - and of course, collecting that important gold coin donation from market visitors! The Club also has a stall from which we sponsor a pre-selected charity and also sell soft drinks during the event. To date we have supported the Lord Mayor’s Bushfire Appeal, purchased a Shelterbox and given financial support to several other local community projects.